So we are back from our Chemoscopy Tuesday and all went well. It was kind of like a progressive dinner but instead of parts of a meal we focused on different medical procedures... just like a progressive dinner though at the end Abby got dessert, a gianormous Popsicle! So IvIG went well, as did the Vincristine. Abby's counts were great, actually a bit too good. Other than being really hungry at CHOA and unable to eat since the night before and unable to drink after 9am she was in good spirits. Things went really quick and in only 2 short videos we were out the door and on our way to the surgery center 15 miles away. We checked in and got everything all filled out and such. Abby was very excited to be able to eat a Popsicle when she got done and also was looking forward to being pushed around in the bed with wheels. The doctor actually took her for an extended ride around the recovery area before taking her into the surgery room. 40 minutes later she was done with both top and bottom "oscopies" and the doctor came to show me the nice color pictures of the inside of her colon and stomach. I know lovely! Good for show and tell later I guess. He gave us 3 copies of each, I don't know why so many really, maybe he is just very generous. He took biopsies of her stomach and colon and is going to have some tests run on them. We won't know about those for a few days or a week. But that wasn't the big news. The big news was that her Cecum and Appendix are not where they are suppose to be. Wierd I know. Remember my family is different, refer to previous posts if you need a reminder. See her a the Schreiber house we try to do things in creative ways. Sometimes it's interesting colored pages that the girls draw, sometimes it's the care bears dressed up in Barbie clothes, and sometimes we just really try to get creative with how our organs are placed in our bodies. Yup our organs. 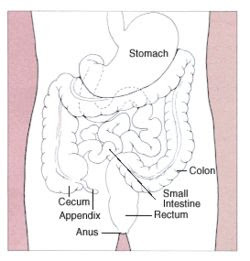 So they found the appendix if you are still wondering. It's just not in the bottom right side of her like it should be. Instead it is in the upper left quadrant. When he said it was in the upper left quadrant I really didn't mind because I had no clue as to what he was trying to say. I still don't really know what he is trying to, or not to, say about this condition. All I know is that it's about 180 degrees out of phase with the normal human. Did any of you ever watch X-Files? Just wondering. Anyway, they'll be doing some more tests on her this coming week at PVH her in Fort Collins. Basically they just want to get an idea of where the rest of her GI track is. I guess that is a nice thing to know. Well, that's all for now on the case of the AWOL Appendix. Stay tuned next time to see where the rest of her organs are! PS. For those of you that have watched X-Files in the past, I can assure you that none of the future test have anything to do with bees, clones and or any vaccine that I know about.